Here to suggest the False Prince Series and the Bartimaeus trilogy. They're both fantasy. Just finished Speak by Laurie Halse Anderson (yes in less than a day but who cares XD). I don't think I've ever been so moved by a book. I honestly can't describe what an amazing book it is and how profoundly I felt everything the author tries to convey to us. Everyone should read it at least once in their life. Such an amazing book. @Bookworm this seems like your kind of thread! I read it when I was younger, but I had to put it down because it hit me too hard T_T Later on, I found out my mom got rid of it along with a bunch of other stuff, so I never got to finish it. I might do that some day c: I'll post about it here if I do! when you finish reading it, let me know what you think!! I still haven't read much of it tbh cause I've been extremely busy with work but hopefully during the weekend I will! Will let you know as soon as I'm finished! It's very touching in some parts anyway, I think I may read Persepolis next. 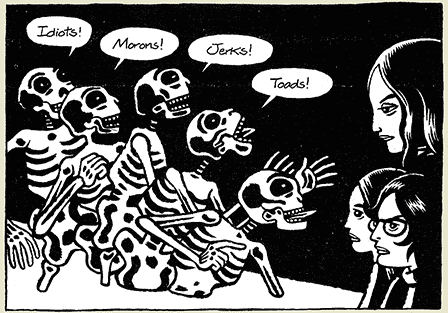 Persepolis is so good, read it long time ago. Can't remember now if I watched the movie made from the graphic novel. Epileptic sounds interesting. Oh n now I realize it's translated into English as by David B. (Safari look up confused me by showing me: L'Ascension du haut mal ("The Rise of the High Evil"), published in English as Epileptic, is an autobiographicalgraphic novel by David Beauchard ) which I know as by David B.
I'll try to check it out but I don't go to comics shop/shops selling graphic novels much now, so may take awhile. Yeah, epilepsy in french is called High Evil, but i think its not an acceptable way of calling it in english. Its a very good book, and David B. helped Persepolis author by suggesting doing an autobiography. Didn't know that David B. suggested her to create her autobiography (Persepolis) ; I remember parts of the graphic novel but forgot if she wrote abt how she decided to create the graphic novel. Ten or so years ago (whenever I first read it) i loved it cos it was so different from the superhero/marvel/DC comics I was used to. Maybe I should dig for it n read it again soon. Discussion What's the one book (or more) you read in school that you really liked? Discussion Have you ever gone to a book festival? Discussion Did you have a favorite book/author as a child?